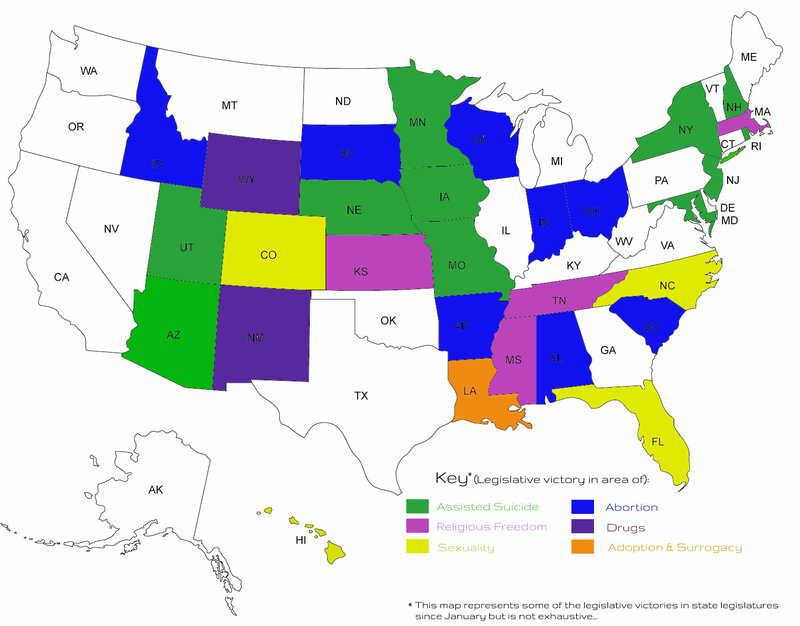 Many state legislatures around the nation meet during the first half of the 2016 calendar year – from January to May. During this five-month period, we witnessed a number of important legislative victories. States affirmed the value of human life by protecting the unborn, while rejecting the idea that other lives are no longer worth living. Other laws were passed to protect religious freedom and rights to privacy. This map (above), as well as the list below, highlights several culture-related legislative victories since January; however, it is not an exhaustive representation of all the victories seen across the country. Much of this success can be traced directly back to the efforts of a strong network of state-based Family Policy Councils (FPCs), with whom Focus on the Family® is privileged to partner. One of the most important benefits provided by these FPCs is their ability to work with state and local elected officials during the legislative sessions to promote pro-family policies.